Note - this camp is for outfield players only. Goalkeepers, please sign up for one of our goalkeeper camps. World-class camps need the world’s top international players and coaches. Our coaching team includes over 100 coaches from more than 20 countries, including World Player of the Year winners, Olympic medallists, World Cup winners and more. Our coaching team for this camp will shown here closer to the event date. Until then, see below some of the many top players and coaches that make our inspirational coaching team so special. + WHAT EQUIPMENT DO WE NEED TO BRING? For outfield players, gumshields and shinpads are an absolute requirement and no young player will be allowed to take part in the camps without these, unless parents sign a consent recognising the risks of doing so. We would NEVER advise playing hockey without gumshields and shinpads, at any age! Beyond that, clothes suitable for outdoor sport and the weather at the time are advised and astroturf shoes should be worn (not football boots). 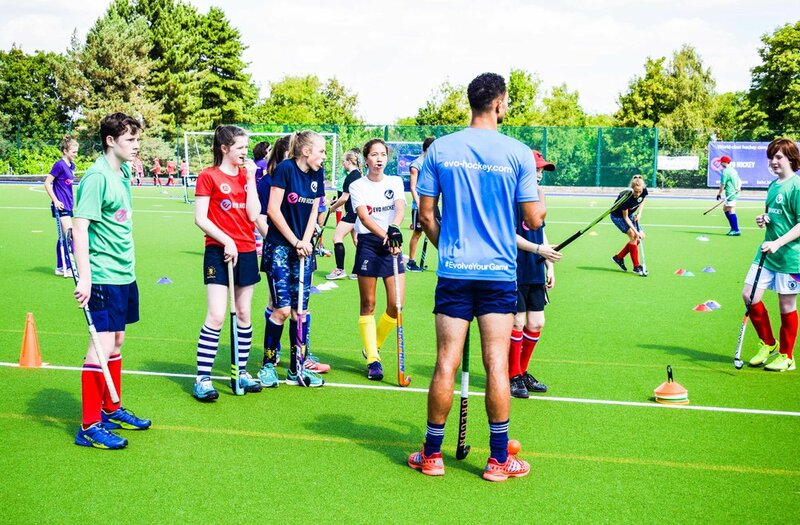 A hockey stick should be brought by your child but please note that we can supply a limited amount of sticks on request, so if one is needed please ask us beforehand to ensure availability! Out on the turf, players spend the day training with their coaches. They will work with every single EVO coach on camp that day and are encouraged to ask them questions and get to know them - specially if they want to learn what the life and training of an elite athlete is like! There is no 'typical' camp day, but across a three day camp players should experience some/all of: skills and drills, assault courses, penalty shootouts, Q&As and coaches skill challenges. And, of course, matches - where you can put what you learned into practice! + MY CHILD IS NEW TO HOCKEY - IS THE CAMP SUITABLE? Yes! When you book your place online, you can tell us their level in the registration form. At every camp, we have groups that are suitable for complete beginners. Players come away from camps inspired by meeting top internationals (sometimes getting to see and hold their Olympic and World Cup medals!) and in love with a new sport. So don't be shy! + MY CHILD IS AMAZING AT HOCKEY - IS THE CAMP SUITABLE? Yes! What better way to push your training to new levels than to work with some of the world's top international players and coaches? We have high performance training groups on each camp day, catering for older youth players and those from County up to and including NAGS standards. Our technical program is designed so that high performance players can flourish in a creative and intensive training atmosphere, with the opportunity for them to get the attention to detail they need. Because our camps are not selection environments, players can explore new skills and make mistakes without fear of 'looking bad' or 'being dropped'. This freedom to push their limits means players almost always come away from EVO Hockey camps stronger and more technically able than before. Couple this with the ability to pick the brains of hockey athletes who have made it to the top of the game (many suffering bumps in the road along the way) and you have the perfect performance training environment. + HOW DO YOU WORK OUT THE GROUPINGS? We group players according to both age and playing experience, to ensure each player is able to maximise their pitch time with the coaches. We keep all players under review and there is the flexibility for individual players to be moved into higher age group sessions (subject to coaching assessments) so that we can ensure we get the best development outcomes for them. Sometimes it is the right call to move a talented player up a level, to challenge them to deal with faster / stronger / bigger / more experienced players. Sometimes it is better to keep them within their age group, in order that they can 'stretch their wings' and continue to develop their talent. It is often a fine balance, but one our coaches are well placed to make! This camp is open to all and run by EVO Hockey with the support of our location partner, Bishop’s Stortford Hockey Club. Their provision of fantastic sports facilities enables us to bring EVO Hockey to the Hertfordshire and Essex areas.